You may want to consider a medical alert pager if you or someone you know is in danger of falling at home. The elderly, and those with disabilities may benefit the most from these devices. If you fall, it may not be possible for you to get back up. Most of us have elderly family members that we worry about, especially if they live alone. Medical alert pagers can give you the peace of mind you need while allowing your loved one the freedom and independence they deserve. If there is a situation where that person cannot get to a phone to call for help, all they have to do is push a button on the monitor or pager they are carrying. There are several kinds and types of medical alert pagers. They are normally part of a necklace or bracelet that is worn throughout the day, keeping it close at hand in case it is needed. Not all pagers call only medical emergency personnel . Some can also be programmed to call a house or cell phone to get help. This type of medical alert monitor is part of a larger system. The system is connected to a phone line, enabling it to call for help. These services are provided at low monthly charges and some are even free. If you choose not to use one of the systems, there is also the option of another pager that emits a loud noise, usually some sort of beep or buzzer that can be heard from far away. Other types of pagers are more geared towards those who live with a family member or caregiver, especially if they cannot yell or call loudly to the caregiver who may be in another room. The pager is worn by the person in need of help and a monitor or base is kept with the caregiver. When the button is pushed, it alerts the caregiver of a possible problem so that they can quickly get to the patient and assess the situation. Whichever pager or system you choose should depend on the patient who will be wearing the device. If they are in need of assistance at home, they may need the whole paging system. If the danger is more when they are out of the house and in public areas, a simple pager that sounds an alarm may work. Other options are better for other people. A little research and some time testing different devices and systems may be needed before you find the right fit for your loved one and their situation. Take your time and choose wisely. Your loved one depends on it. 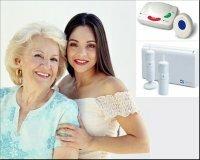 Ask Your Medical Alert and Home Alarm Question HERE!